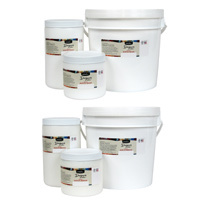 Designer's Palette® Artists' Acrylic Gesso and Mediums offer the highest quality for the professional artist. 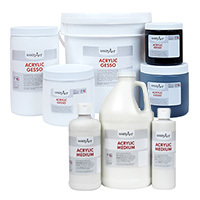 Handy Art® Student Acrylic Gesso is an exceptional and economical choice for students and professionals. Student Acrylic Mediums are formulated to expand the possibilities! 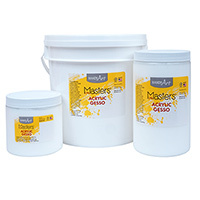 Little Masters® Acrylic Gesso is ideal for the budding artist! Designer's Palette® Artists' Acrylic Gesso and Mediums, Handy Art® Student Gesso and Mediums and Little Masters® Acrylic Gesso are certified AP non-toxic. • Exceptional non-yellowing high viscosity primer. • Highly pigmented for ultimate coverage. • Dries to a permanent, water resistant and flexible brilliant white matte finish. • Add to acrylic paint to increase viscosity. • Thick white gel dries clear and transparent. • Use for special techniques which require thicker paint. • Apply over dry acrylic paint as a clear coat for glossier finish. • Add to acrylic paint for a transparent effect. • Apply over dry acrylic paint for a matte finish. • Add to acrylic paint to decrease gloss. • Add to acrylic paint to slow the drying process for longer workability. • Use to create three dimensional, textured surfaces for painting and art projects. • Thick paste dries to a hard opaque surface. • Excellent quality medium body primer. • Dries to a permanent, water resistant and flexible matte finish. • White dries bright white and is non-yellowing. • Black provides dark background or high contrast. • Add this thick clear gel to acrylic paint to increase viscosity. • Gel Medium dries clear and transparent. • Apply over dry acrylic paint as a clear coat to add a glossier finish. • Add to acrylic paint for a glossy or transparent effect. • Economical non-yellowing medium body primer.